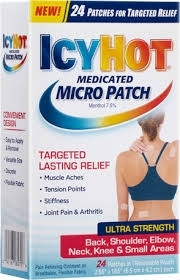 Promotes targeted lasting relief of muscle aches, tension points, stiffness, and join paint and arthritis. Convenient design. Easy to apply and remove. Versatile size. Discrete and flexible fabric. Ultra stength for back, shoulder, elbow, neck, knee and small areas. Pain relieving ointment on breathable, flexible fabric. Gently fold patch in half and remove one side of backing. Apply exposed adhesive to the site of pain. Remove remaining film from the other side and finish applying to skin. Use on affected areas for up to 12 hours.